Joe Slovo and Ruth First were both exposed to radical ideas in early childhood, ideas that were fuelled at university in Johannesburg in the 1940s. When the couple married in 1949 they were leading activists against the National Party and helped to develop what became the Freedom Charter of the ANC. With pressure building on activists in South Africa, the couple fled to the UK in 1966. For the next 12 years the Lyme Street house became a base for exiled activists seeking change in South Africa, with the couple living on one floor and Ruth First’s parents living in the basement. Ms First spent much of her time in Camden Town writing, including three seminal books on African politics, and editing Nelson Mandela’s 1967 autobiography. She also held teaching posts at Manchester and Durham universities. Meanwhile, Mr Slovo led the life of a revolutionary organiser. He was the first white member of the ANC’s national executive and was appointed chief of staff of the MK, the armed wing of the ANC. From Lyme Street he planned missions against the South African regime. By 1978, uprisings, sanctions and anti-apartheid opinion began to turn the tide against the regime and the couple moved to Mozambique. Four years later, Ms First was assassinated by the South African secret police but Mr Slovo continued his work to its eventual successful resolution. He died of cancer in 1995. HUNDREDS of people packed into a small Camden Town street last Friday to witness Nelson Mandela pay tribute to two former South African freedom fighters. 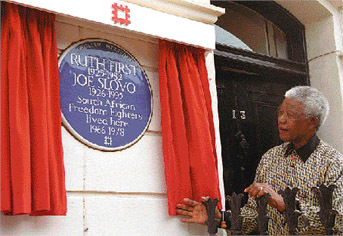 The 84-year-old was in Lyme Street to unveil an English Heritage blue plaque commemorating Ruth First and Joe Slovo. The couple became close friends with Mr Mandela in the battle against apartheid in South Africa but were forced to take sanctuary in the UK from 1966 to 1978. In that period, the three-storey house in Lyme Street became their home and the meeting place for exiled anti-apartheid activists. Crowds crammed the street, making use of walls, trees and stepladders to get a glimpse of the former president of South Africa. Many passers-by who had unwittingly stumbled on the scene put off work or chores until after Mr Mandela’s appearance. Others rushed off to fetch cameras to capture the historic moment, on Friday last week. When Mr Mandela emerged from his car it was to an emotional outbreak of applause. His first duty was to greet the choir from St Michael’s School who had welcomed him with songs, including He’s Got The Whole World in His Hands. Frank Dobson, the MP for Holborn and St Pancras, who played a key part in ensuring the plaque was put up, was close to tears as he introduced Mr Mandela to the crowd. Physically, the 84-year-old Nobel Peace Prize winner, who spent 28 years in prison, walked gingerly with a stick. But his speech demonstrated his mind is still far from frail. He spoke with passion, humility and humour about his comrades Ruth First and Joe Slovo, the struggle against racism and how he gave away a £250,000 donation from Margaret Thatcher to the South African Communist Party. Mr Mandela said: “We are honouring two eminent South Africans who as young people decided to join against those forces who suppressed millions of people in our country. He described Ms First as a “sharp lady who didn’t suffer fools”, and Mr Slovo as “a very level-headed comrade”. In 1982, after returning to South Africa, Ms First was killed by a letter bomb sent by the South African secret police. Mr Slovo continued to oppose the regime and was part of the African National Congress negotiating team that paved the way for the first democratic elections in 1994. He died of cancer a year later. Those who witnessed Mr Mandela’s speech said they were honoured to be in his presence. Gerry Harrison, the Labour councillor for Cantelowes, told the Ham&High: “It was incredibly moving and it was wonderful to be here. Christabel Gurney, 59, who was a friend of Ruth First, told the Ham&High: “It brought back a lot of memories.